This is *SUPER* HOT! 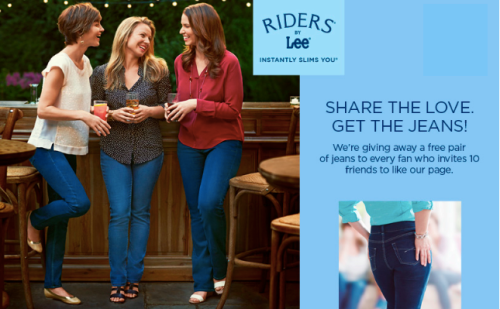 Run over and "like" the Riders by Lee Facebook page and click on the Share the Love tab to possibly score a FREE pair of jeans!!! Simply fill out the form to receive a unique link to share with your friends! If you get 10 of your friends to sign up you'll get FREE jeans!! *There is a limit to one pair per person!